Change your life. One mile at a time. We believe that "Running Changes Everything". It trims our waistlines and boosts our immune systems. It makes our hearts and minds song. It empowers us to tackle new adventures in our personal and professional lives. It connects us to new people who quickly become "sole"mates. It makes us laugh. It allows us to indulge in our favorite food and drink. It gives us purpose. It enables us to do something good for ourselves. Last year over 500 people, from first-timers to seasoned runners, experienced the power of running through our training programs. Participants become like family, and we are honored to be a part of their journey, witnessing their triumphs as they crossed the finish line, conquered new distances and shaved minutes off previous personal bests. We invite you to join us and experience your own life-changing adventure. We have programs for all ability levels - walkers, aspiring runners, as well as those who want to be more competitive. We even have a drop-in program for distance runners who want to train with a group, but don't want the structure of a formal training program. Our professionally-designed programs offer more than just a workout. From Day One, you will become part of our running/walking community where experienced coaches will work out WITH you and cheer you on. You will make new friends with similar goals, and enjoy a motivational atmosphere that helps keep you engaged so you want - and can - stick with the program...even when it snows or rains! 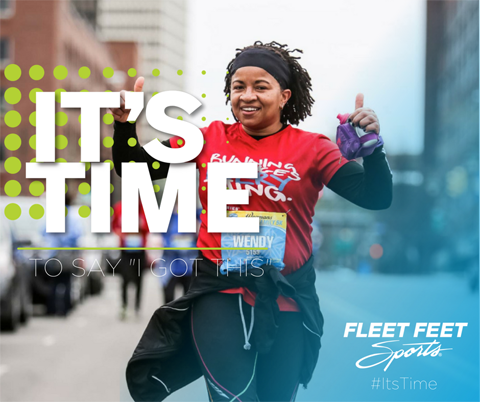 Learn more about the free Fleet Feet Running Club here. Description: Cross training is an essential element of leading a fit and healthy life. Every movement you make starts from the core. Develop a strong core and you will not only see improvements in performance, but it can help prevent injury which allows you to consistently train harder and build upon your successes. Great things happen when you focus on becoming fundamentally strong. Description: Training for and completing a Half Marathon is a challenging and rewarding endeavor – especially when you want to improve upon past performance…and not just by a few seconds. Achieving a serious personal best takes commitment, hard-work and dedication. It also means addressing your weaknesses, varying your training and trusting the training plan even if it may seem a bit nontraditional compared to other training programs. If you are ready for a challenge & want to get stronger/faster, this program may be just what you were looking for.